Panzer Grenadier covers dozens of topics with thousands of scenarios. Invasion 1944 is your gateway to that world. 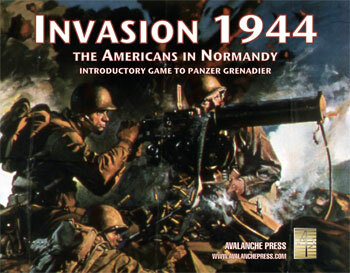 Based on the battles waged by American troops in the days following the landings in Normandy, Invasion 1944 is specifically designed to introduce new players to the Panzer Grenadier system. Each player commands the troops, tanks and artillery of the U.S Army and the German Wehrmacht, using leaders to activate and move forces. There are twenty-one scenarios (separate battle situations) depicting the fighting, presented in graduated fashion – you only need to learn some of the rules to play the first few scenarios, then some more rules for some more involved scenarios, and so on. Panzer Grenadier is already a pretty easy game system to learn how to play, and with Invasion 1944 it’s even easier. There’s plenty here for veteran Panzer Grenadier players, too: Two new maps by Guy Riessen, depicting the bocage and farmlands of Normandy. 176 new playing pieces (including units, leaders and markers). Twenty-one new scenarios by ace designer Mike Perryman, most of them based on actions of the U.S. Army’s 29th “Blue and Gray” Infantry Division.